An aerial view of Cyberjaya city. While Setia Haruman Sdn Bhd still holds the title “Master Developer” of Cyberjaya, another company Cyberview Sdn Bhd states that it is the mastermind for the development that ensures the city remains at the forefront. Cyberview managing director Hafidz Hashim says the company’s role grows into one that encompassed construction and leasing out buildings, then evolves further into one where it is responsible for masterminding the entire development of Cyberjaya. “There is a clear demarcation between Cyberview’s roles and responsibilities and that of Setia Haruman. The latter’s roles are scaled down to undertaking the construction of main infrastructure, planning the overall preparation of Cyberjaya and selling land parcels and other real estate developments. “We now promote the city internationally, build infrastructure and develop and implement initiatives that will drive the city’s development which includes the creation of an attractive and sustainable eco-system for investment,” he tells StarBizWeek in an e-mail reply recently. He says Cyberview promotes Cyberjaya as a preferred address for homegrown and international companies. “We also take a step further by providing guidance to potential investors to identify what they need to make their investments here attractive. We try to find out their plans, requirements and expectations, and will tailor their investment packages accordingly,” he adds. To date, over RM1bil has been invested in Cyberjaya where since 2005, Cyberview has dedicated some RM80mil towards the physical infrastructure and sustained maintenance of the city. “These include bus shelters, pedestrian walkways, traffic light junctions and streetlight maintenance,” he says. Elaborating further on the existence of Cyberview and its roles in Cyberjaya, Hafidz says Cyberview, which is a government-owned company, is the landowner of the cyber city. “We were given the mandate by the Government to spearhead the entire development of the township in line with its aspirations to realise Cyberjaya as MSC Malaysia’s Cybercity and as a global hub and preferred location for ICT, multimedia and services for innovation and operations; and to fulfil specific Government initiative in support of the innovation economy,” he says. When the company was formed in 1996, its shareholders include Setia Haruman (55%), Nippon Telephone and Telegraph (15%), Golden Hope (10%) and Permodalan Nasional Bhd (5%). Setia Haruman was then asked to lead on the development of Cyberjaya. Hafidz says that by 2005, following an internal restructuring in Setia Haruman and the company’s practice of awarding contracts at high premiums, Setia Haruman had to take up substantial loans. “This has led to its gearing ratio ballooning to an unsustainable amount. Cyberview was then asked by the Government to rescue the ailing Setia Haruman that led to an expansion of Cyberview’s role,” he says. Hafidz says that in 2006, the Government had asked Cyberview to start taking an active role in the implementation of various developmental and governmental initiatives. “We were also tasked to undertake city-wide maintenance and rehabilitation and spearhead investor interface and community-centric programmes in Cyberjaya. That was when Cyberview began embracing its role as a community builder,” he says. Through close consultations and feedbacks from its customers and the Cyberjaya community, Hafidz says Cyberview has created and implemented several unique initiatives which add to Cyberjaya’s attraction as an investment location. 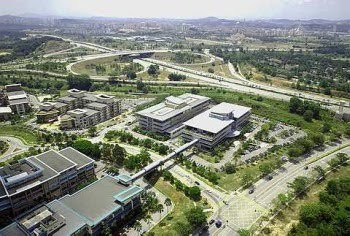 “These include initiatives that reduce the cost of doing business in the area of transportation via the Dedicated Transportation System and the complementary intra-Cyberjaya “Park-and-Ride” system as well as energy management and cooling via the Cyberjaya district cooling system provided by Pendinginan Megajana, a wholly-owned subsidiary of Cyberview,” he says. Other initiatives include in knowledge-worker and talent development where Cyberview pioneered the Cyberjaya GREAT programme. Under this programme, interns are matched with knowledge-based small and medium entrepreneurs in Cyberjaya for a 6-month exposure to real work experience and they are given soft skills training to help them attain the criteria as outlined by the industry. On safety and security issues, especially given the many high-impact investments by various parties in Cyberjaya, Hafidz says Cyberview has put into place the City-wide Surveillance System comprising 30 closed-circuit television (CCTV) cameras installed in the city. Operating round-the-clock, these CCTVs, which is directly linked to the Malaysian Emergency Response System 999, enhance security level in the cyber city. “This has paid off well as Cyberview has turned Cyberjaya into a premiere cyber city, experiencing exponential growth of 70% since 2006 in the number of companies choosing the city as their preferred location,” he says. On the outlook for Cyberjaya in the coming years, Hafidz says he feels very optimistic. “I’m bullish. Cyberjaya has been identified as a pioneer Green City by the Government and our development aims to reflect that while taking into consideration the needs of the community. “The challenge for Cyberview is to see the physical growth of Cyberjaya remains sustainable and attractive,” he says. Putrajaya’s population now stands at about 75,000. PUTRAJAYA has been declared the epitome of gracious living by many, but Malaysia’s administrative capital still has some way to go before it can truly be declared a model city. Association of Valuers, Property Managers, Estate Agents and Property Consultants in the Private Sector Malaysia (PEPS) president James Wong believes that Putrajaya needs a meaningful transport system to make it more “liveable”. This, in turn, will attract the crowds to make it more vibrant, he adds. According to the website of Putrajaya Holdings Sdn Bhd, the administrative capital’s master developer, Putrajaya’s current population (working and living) is about 75,000. Wong feels that setting up attractions, such as museums and art galleries, was a great way to pull in the crowds. He also notes that it has long been planned for many of the foreign embassies to relocate to Putrajaya but this has yet to happen. “There was supposed to be a diplomatic enclave in Putrajaya, with the embassies moving there. With the Immigration Department and many Government agencies already present there, it would be a good move for the embassies to relocate,” says Wong. Putrajaya currently has just one shopping mall – the Alamanda Putrajaya in Precinct 1. Malaysian Association for Shopping and Highrise Complex Management advisor Richard Chan points out that the population there is not big enough to support a second one. “To have a successful shopping mall, you need to have a population with good spending power. Right now, I wouldn’t recommend building a second mall in Putrajaya,” he says. Chan adds that having homes that are affordable is a good way to boost the population in Putrajaya. Zerin Properties chief executive officer Previndran Singhe says the homes in Putrajaya starts from about RM450,000 onwards. “Putrajaya is a great place to live. The homes are affordable but there is insufficient infrastructure or commercial activity,” he says. He adds that for a city to be successful, it needs to “relate to its people.” “Cities like Kuala Lumpur have holidays like Federal Territory Day to cater to its people. Putrajaya needs to have events like that,” he argues. 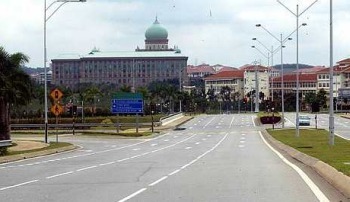 Putrajaya is about 25km from Kuala Lumpur. To CB Richard Ellis Malaysia Sdn Bhd managing director Allan Soo, that is an issue for now. Soo says there should be more dedicated highways that connect directly to Putrajaya. Currently, the Maju Expressway links Putrajaya directly to the Kampung Pandan interchange. Soo also says there should be more private sector participation in the development of Putrajaya. 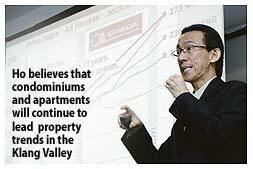 “There needs to be more private developers rather than GLCs (government-linked companies). Right now, Putrajaya feels like it’s GLC-driven,” he adds. Earlier this week, it was reported that Putrajaya Holdings would be calling for tenders for projects worth over RM1bil. Chief executive officer Datuk Azlan Abdul Karim said the tenders were to build four office towers worth a combined RM700mil, residential properties and office blocks. In the report, companies such as Ahmad Zaki Resources Bhd, IJM Corp Bhd, Sunway Holdings Bhd, the UEM Group and Ireka Corp Bhd were linked to the bids. When contacted, Sunway Holdings and Ireka declined to comment on the matter. PETALING JAYA: High-rise living, security and proximity to amenities and other conveniences are current trends in the property markets, while green buildings are the way to go in the future, several speakers at a seminar said. Contrary to what many believe, Mont’Kiara will continue to grow as a popular condominium enclave after Bangsar, Klang Valley’s first condominium hub, said Ho Chin Soon Research Sdn Bhd managing director Ho Chin Soon. Ho was speaking at the “Future Trends in Property” seminar organised by Sunway City Bhd here yesterday. The three main condominium enclaves in Kuala Lumpur are KL City Centre (KLCC) area, Mont’Kiara and Bangsar. There are today a total of 390 buildings or 24,200 high-rise residential properties (serviced apartments and condominiums) in the Golden Triangle of Kuala Lumpur which includes KLCC area; Mont’Kiara, Damansara Heights, Bangsar, Ampang and Sentul. Despite the thousands of units in Mont’Kiara, the area would continue to grow as it has been doing the past three years, said Ho. “Once a favourite among the expatriate community, Mont’Kiara today is increasingly being occupied by Malaysians who have decided to make that location their home,” he said. Because of security issues and the unwillingness to live in further places like Rawang and Nilai, people would opt to live in high-rise, he said. This would be the trend in thecities and other parts of the country like Penang. Ho said as the economic recovery took off, developers preparing to launch must take into consideration three main factors - location, timing and branding. “Demand and supply are not everything about land economics,” he said, adding that the other change to note in Mont’Kiara was the trend towards commercial. “People doing buinesss will want to go into that location,” he said. Veritas Architects Sdn Bhd principal founder and chief executive officer David Mizan Hashim said “green” elements were the other trend in the property market. “Places which have low energy consumption, sanitaryware and faucets which promote efficient water consumption, and sustainable features are increasingly become popular. “People will increasingly want flexibility to convert a three-room unit to two or vice versa. This means the introduction of screens to support the desire and need for flexibility,” he said. He said the popularity of gated and guarded projects would continue to grow and spill over to places like Johor, Perak and Penang. “Even within a high-rise residential development, increasingly buyers will want new elements and features that set it apart from the rest,” he said. Older projects will become the casualties in this demand for better and more innovative residential developments. Not forgetting the need for innovation and technology in today’s lifestyle, Research Inc (Asia) Sdn Bhd managing director Datin Adila Lim Lay Ying cautioned against allowing designs to be defined by technology. She said past examples overseas showed that futurish designs emulating science fiction did not work. “Buildings of the future should allow us to express ourselves, how we want to live and work,” she said. On the KLCC and the various projects ongoing, she said the number of projects there would continue to grow and prices continue to rise, with certain projects to hover between RM2,500 and RM3,000 per sq ft.
SA Architects Sdn Bhd director Richard Sau said “green” features would continue to add value to projects. Sunway City Bhd (SunCity) is the latest to join a growing line-up of property developers, which includes SP Setia Bhd, to express interest in developing government land identified for development by the private sector. Under the New Economic Model (NEM) unveiled by Prime Minister Datuk Seri Najib Razak, several parcels of land in Jalan Stonor, Jalan Ampang and Jalan Lidcol in Kuala Lumpur will be tendered out for the purpose. "Yes, we are interested to bid for the project. But we have to wait for them (the government) to disclose details of the proposed site," SunCity managing director Ngian Siew Siong told reporters on the sidelines of the "Future Trends in Property" seminar, organised by SunCity, in Kuala Lumpur yesterday. Earlier, in his speech, Ngian said that SunCity aimed to embrace the "lifestyle of health and sustainability" (Lohas) concept in all its developments, marking a trend in the property market. The group sees such incentives as value-add to its developments. "A Lohas customer is attracted to socially and environmentally responsible movements. Some of the offerings that will attract Lohas customers are spa and fitness centres, recycling activities, eco-tourism, and homes and buildings that promote the Lohas lifestyle," he said. Lohas is already big in developed countries like the US and Japan where a rapidly growing group of consumers are becoming more earth-conscious and socially responsible. Among SunCity projects that have adopted Lohas designs and offerings are Sunway Challis Damansara, Sunway Palazzio in Sri Hartamas, and Sunway Vivaldi in Mont'Kiara. On a separate note, a speaker at the seminar - property valuer Ho Chin Soon - said that condominiums and apartments would still lead the property trend in the Klang Valley this year. Developers tend to maximise the pockets of land available by building condo townships to cater for demand. "The market trend in going green environmentally and socially is also among the upcoming trends picked by developers in their future developments," Ho said. The show unit’s dining (left) and living area (right). 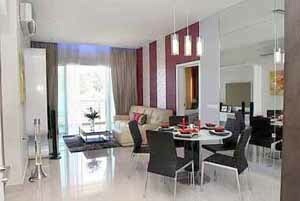 The Haven is expected to raise the bar in condominium living in Ipoh when completed in 2013. 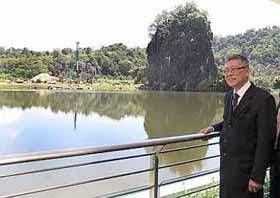 The Haven Sdn Bhd co-principal Peter Chan says the RM230mil lakeside development will boast five-star services and amenities. Peter Chan enjoying the view of the lake from the balcony of the show unit. “The Haven is a development of distinction with trappings of luxury and functionality. It is an idyllic hideaway amidst nature with its centrepiece – a 1.6ha natural lake and monolithic limestone rock formations,” he says. The project comprises three blocks of 26-storey condominiums with a total of 489 units built on 9.63ha. It will include all the facilities of an up market condominium including a club house complete with gymnasium, sauna, a cafe/restaurant, a 60 m pool, spa, children’s playground and ample car parking facilities. Chan says preservation of nature formed the cornerstone of the development as the company recognises the need to care for the environment and to reduce its carbon footprint. “Our aim is for The Haven to be among the first developments to harvest nature’s renewable resources to power and maintain common areas. We will use solar panels and wind technology. Water from the lake will be harvested for common washing areas,” he says. According to Chan, the water from the lake can be used for drinking as its quality surpasses the World Health Organisation’s requirements. Despite being so close to nature, The Haven is only 10 minutes from the city centre and between three and eight minutes to all the major hypermarkets. The Haven, Chan says, will have multi-layered security such as closed-circuit televisions, computer card access for residents, fenced perimeter and regular security patrolling. The size of the units range between 893 sq ft and 2,840 sq ft and are priced from RM270,000 to RM1.4mil. “Response has been overwhelming since our show unit was opened for viewing recently,” Chan says, adding that buyers from Singapore and Hong Kong had purchase some 60 units so far. “We are confident of its appeal as a home for those in Ipoh as well as a retreat or vacation home for other Malaysians and foreigners,” he says. The Haven Sdn Bhd is a wholly owned subsidiary of Superboom Projects Sdn Bhd. Superboom Projects is the developer of the 576-unit Permai Lakeview Apartments in Ipoh and Subang Galaxy in Shah Alam. There is growing interest to redevelop old government buildings or land that has been left idle for sometime. The shortage of land in good locations in the capital city has made land prices escalate manifold in the last couple of years. The Government’s plan to sell some of its undeveloped land around Kuala Lumpur for development by the private sector has also attracted interest in land and government buildings. This has led property companies to look for good redevelopment opportunities where land with unoccupied buildings can be given a new lease of life. It is important to ensure complete transparency in the project awarding process for any government land project. Redevelopment projects could run into millions of ringgit. To avoid criticism of biasness, the best approach is to invite proposals via an open tender system. Some buildings may be severely dilapidated and may need to be completely torn down before any redevelopment work can proceed. But there are buildings that have historical significance and it is important to ensure all efforts are expended to restore and retain their historical value. For example, the Keretapi Tanah Melayu Bhd (KTMB) headquarters located on Jalan Sultan Hishamuddin, Kuala Lumpur. The building, which was built in 1910, is owned by the Government through the Railway Assets Corp. Dating back to the country’s pre-independence days, the building is a national heritage and its unique architecture is a fine example of the British colonial adaptation of Moorish architecture. But many firms have expressed interest in wanting to redevelop the KTMB building because of its prominent location and value. Any redevelopment plans should preserve the heritage and value of the KTMB building. It may be a good idea to turn a section of the building into a railway museum. There have also been suggestions to relocate the Sungei Besi military airport to another location and to redevelop the 459-acre site. But to-date, no details have been revealed on the redevelopment plans. Whether government or privately owned, redevelopment can raise the value of existing land and property developments. For redevelopment plans to succeed, developers should have the right expertise to add value to the land or property. There should be proper planning to ensure the new project will benefit the people. It must have proper infrastructure, including new roads, to prevent traffic congestion, especially if it is a commercial project. Safety should be a top priority in any demolition work of old buildings. Some may be high-rise buildings and this calls for extra care and planning to prevent any untoward mishaps. There should be careful coordination among parties involved including the developers, site supervisors, contractors, workers and the local authorities. The public and residents living around the work site should be given due notice before starting any demolition work. As with all property projects, there should be approvals from all the relevant authorities for the new land use, and structural and layout plans. Proper cost and financial planning should be undertaken to ensure the project’s feasibility. Deputy news editor Angie Ng hopes to see more family-oriented recreational facilities provided in new developments around the country. SINGAPORE: Southeast Asia's biggest property developer, CapitaLand, said yesterday it will seek more opportunities in China and Vietnam after its first-quarter net profit more than doubled. Home prices in China, Hong Kong and Singapore have risen sharply over the past year, sparking fears of property bubbles in some Asian cities. But CapitaLand said it was confident strong economic growth would lend support to regional property prices. "CapitaLand remains confident of Asia's long-term growth potential and is well-positioned to ride on the recovery of real estate markets," chairman Richard Hu said in a statement. "We will continue to deploy funds to our businesses in China and Vietnam, and the serviced residence and integrated shopping mall businesses," he added. The Singapore firm posted net profit of S$115.4 million (S$1 = RM2.33) for the first quarter ended March, up 169 per cent from S$42.9 million a year ago as it sold more homes in Singapore, China and Vietnam. DBS Vickers analyst Lock Mun Yee said she had a "buy" recommendation on CapitaLand with a target price of S$5.08 because the stock was trading at a large discount to estimated net asset value of S$5.65 a share. "There are near-term drivers from residential developments and the retail business is doing quite well," she added. CapitaLand, which is also Asia's second-largest property fund manager after Morgan Stanley, had a cash balance of S$5.7 billion and net debt-to-equity ratio of 0.27 at the end of March 2010. About 62 per cent of its revenues came from outside Singapore. CapitaLand shares closed 1.44 per cent lower yesterday at S$4.10. BEIJING/SHANGHAI: China's cabinet on Saturday, April 17 laid out further detailed measures for keeping the property sector in check, empowering and ordering local governments to take steps to control speculative buying, according to Reuters. Provincial and municipal governments in areas experiencing rapidly rising property prices may temporarily restrict the number of properties people may buy, in accordance with the situation in their jurisdictions, the State Council said. The measures also made clear to banks that they would be expected not just to raise mortgage rates and down payment requirements, but to refuse credit to people who are clearly buying homes for speculative purposes. The announcement drives home the seriousness of Beijing's clampdown on the red-hot property market, launched in earnest on Thursday with an order to raise mortgage rates and down payment requirements. "The prices of houses and land in some cities have seen overly fast increases recently, and speculative purchases have becomes quite active again, requiring our close attention," the cabinet said in a statement on the government website www.gov.cn. The directives come on the heels of an acceleration in urban property inflation to 11.7 percent in the year to March from February's 10.7 percent reading. Economists believe the official figures grossly understate the extent of price rises, especially in major cities. Saturday's fresh directive laid out rights and responsibilities of provincial and municipal governments in combatting rapid rises in property prices, which have hit some areas more than others. "All regions and related agencies must fully recognise the harm of overly fast rises in property prices and effectively enforce policies decided by the central government and take resolute measures to contain property prices," it said. Banks should "noticeably" raise down payment requirements and mortgage rates for people buying their third or subsequent home, the cabinet said, without specifying rates. In cities where home prices are rising quickly, banks may refuse mortgages to anyone buying their third or subsequent home as well as to people who cannot prove residence in that city through tax and social insurance records, it said. The recent steps to control the property market reflect authorities' worries about the social implications of sky-high housing prices, as well as over the damage that could be brought to the world's third-largest economy should asset prices get out of control and subsequently fall. They also tie into an overall concern about the economy overheating, after data released on Thursday showed it expanded by 11.9 percent in the first quarter from a year earlier. While consumer inflation remained subdued in March, at 2.4 percent compared with 2.7 percent in February, officials say inflationary expectations and higher commodity prices could add to upward pressure on prices. Yao Jingyuan, chief economist at the National Bureau of Statistics (NBS), said on Saturday that the government could find it difficult to contain consumer inflation within the target for this year of 3 percent, though industrial overcapacity and a good harvest could help contain it. Thursday's property measures hit real estate-related shares. Developer and construction firm China State Construction Engineering Co fell 0.5 percent, and China Vanke fell 0.8 percent. Analysts expect the bill yield curve to steepen in the coming week, spurred by rising worries over property prices and inflationary expectations.